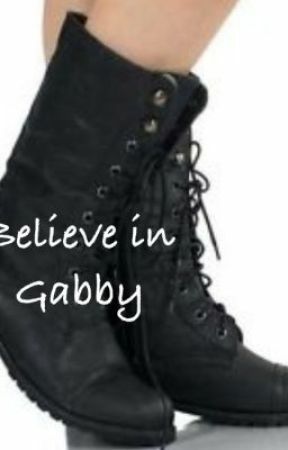 I beforehand had put my ring gear, which was some light blue ripped jeans, brown boots and a blue Gabby Bryan top. I closed my eyes as my music blared through my headphones. The beat of the music helped to calm down the nervousness of my beating heart. I had never been anymore nervous for my match in my entire life. I had already taken my lap around the arena and was now stretching as I tried to prepare for my match. The match against my brother. Focus, I thought, taking a deep breath, You can do this. It&apos;s funny how quickly things can change in a month. One time you have a brother and the next he stabs you in the back. Why are you making me do this, Seth, I thought, rubbing my temples with my fingers. I felt someone grasp my shoulder and I jumped in the air about a foot before turning around to turn the person, my eyes wide with alert. I lifted off my headphones as I kept my eyes on her, "Hey Brie." Brie smiled at me, "Hey Gabby," she settled down next to where I was sitting on the floor. Their was complete silence before Brie spoke again. "Do you have a match tonight?" I started flexing my hand, staring at it, "Oh yeah." Brie nodded, "That&apos;s great. Who are you facing?" The smile that was once on her face was abandoned. Instead, her eyes held uneasiness. "Seth just gave you a match against him?" I shrugged my shoulders, "I guess." Brie&apos;s mouth went thin, "Where&apos;s Dean?" "Banned from the building," I told her, not even being able to look at her. If Brie had been worried before, that wasn&apos;t even close to how uneasy the look on her face was now. "Gabby," Brie slowly said, "You can&apos;t go out there..."
"Yes I can and I am," I told her. "You don&apos;t think any of this sounds suspicious?" Brie questioned, raising an eyebrow. "Oh, it sounds very suspicious," I assured, "But I don&apos;t care." "I&apos;m not," I said, "This is my only chance to get my hands on Seth Rollins and I am not going to miss it for anything." Brie grabbed my wrist, "It&apos;s a set up." "I think I&apos;m used to being set up by the authority," I pulled my hand away, "I can handle it." "No you can&apos;t," Brie said in a serious tone, "They banned Dean from building!" I sighed, "I know that, Brie. What is your point?" "I can&apos;t believe this." Brie said in shock, "You&apos;re going to give Seth the satisfaction on putting one over on you." "He&apos;s not going to put anything over on me!" I exclaimed. Brie stared into my eyes, "Listen, if you go out there you will regret it for the rest of your life." "I doubt my whole life or career is going to circle around one little thing like this," I got up.